There are many aspects of the Cleveland Indians‘ surprising season which are still tough to explain. How did Mike Napoli become the power hitter the team has been missing for years? How is Rajai Davis contributing more than Michael Bourn ever did? How is Tyler Naquin still batting above .300? As head-scratching (and much-welcomed) these all are, there’s no bigger stunner than the fact Cleveland is playing so well without arguably the best hitter on its roster. The Tribe has a healthy lead on first place in the AL Central, yet Michael Brantley has barely touched the field this year. After undergoing shoulder surgery in the offseason, the 2014 MVP nominee has struggled to get back to full strength. Brantley appeared to be on the comeback trail last week, but suffered yet another setback. Now, with the trade deadline looming on the horizon, Cleveland has to decide if it needs to make a move to add to the outfield or hold out hope Brantley can eventually return and contribute in a big way. Honestly, as important as he is to the team, the latter strategy is way too risky. As a result, the Indians need to take to the trade deadline under the mindset Brantley won’t be around this year. As mentioned, as recently as last week it appeared as though Brantley’s return was imminent. He was getting in his rehab starts and not dealing with any pain. However, yesterday news broke stating the shoulder discomfort was back. He’ll be getting an enhanced image to see if there’s any new damage, but it certainly seems as though he won’t be back any time soon. Obviously the Indians will hold out hope that their current surge can be bolstered even more by the return of one of their core players. Still, said hope shouldn’t prevent them for looking outside their clubhouse for help at the deadline. For one, Brantley has spent all but eleven games of this season either on the shelf or attempting a minor league rehab start. This isn’t exactly comforting news, nor does it imply he’ll ever really be fully healthy this year. Even if he does make it back to the Indians’ lineup, the team can’t just assume he’ll go right back to being the reliable middle-of-the-order bat he’s been the past few years. It’s way too dicey to bet on him getting right into the swing of things at the plate (lame pun intended). Without Brantley, Cleveland’s outfield depth is shallow. Davis has been solid, while Naquin is currently looking like a potential rookie of the year. Outside of these two, there’s Lonnie Chisenhall and Abraham Almonte. The former has held his own after transitioning from third base, the latter is still struggling to make an impact after returning from a PED suspension. Jose Ramirez has shown he can play outfield if needed, but the Tribe would rather have him as the utility infielder. As you can see, any sort of injury could significantly hurt Cleveland’s outfield depth, and trying to wait out Brantley might not be an option. 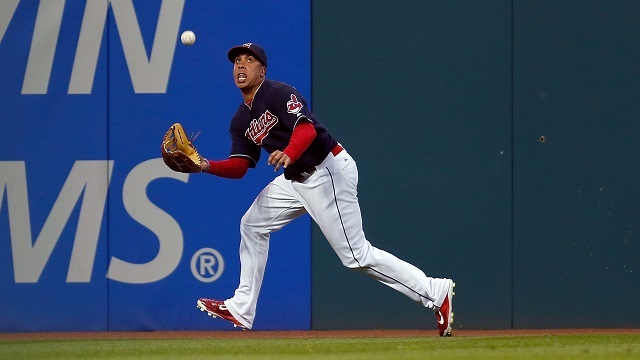 There are possibilities available for the Indians when it comes to outfielders to trade for. Jay Bruce continues to be a popular name, while Carlos Beltran would also be a cheap solution. Both could add much needed power at the plate, as well. The Indians could surprise everyone and deal for Yasiel Puig, but this seems unlikely due to how much the team values clubhouse chemistry. Either way, the Tribe has to do something to boost its outfield. While it would be perfect to have Brantley return soon and potentially push the team over the top, the odds of this happening don’t look good right now. As a result, the Indians need to approach the deadline as they would if Brantley was done for the year. If they continue to cross their fingers in hope for his return, it may end up burning the team in a bad way.